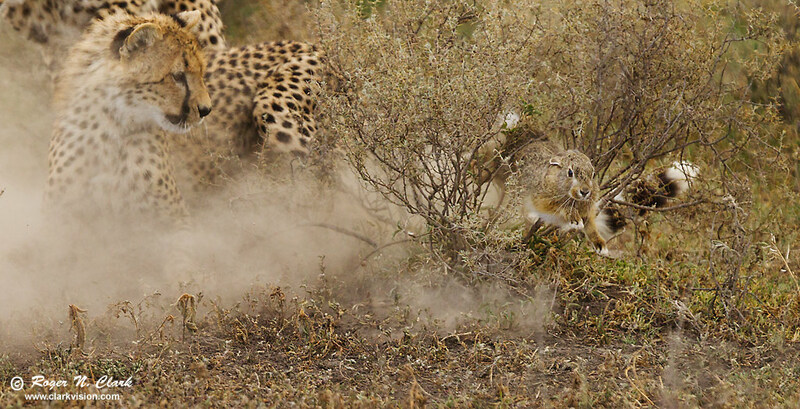 A mother cheetah and her two 1-year old cubs chase a rabbit on the Serengeti in Tanzania. Such an event at close range is very rare. After many hundreds of hours photographing on the Serengeti, and many cheetah chases, they are usually quite distant because if one moves too close, it disrupts the hunt. We were watching these cheetahs for a while and I was ready to move on, when suddenly they flushed a rabbit and the chase was on, and it was toward us. The mother let the cubs complete the hunt, which was quite chaotic. In this image, the cub did not catch the rabbit; the rabbit escapes and makes a dash for its life. Technical. Canon 1D Mark IV 16-megapixel digital camera, Canon 300 mm f/2.8 lens with 1.4x TC: 420 mm at f/4.5, ISO 400, 1/1000 second exposure. Manual exposure. Cropped to 9.6 megapixels.